The Rainy Pacific Winter arrives! We have had over 4 inches of rain in the past two days! So long beautiful October Indian summer!! so sad. My poor little yard is mush, much like the rest of the NW. These next few months are my least favorite. Too soggy. 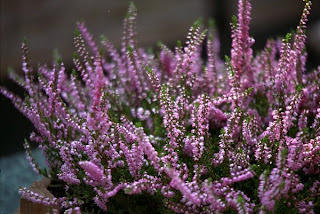 But some of the plants that get to shine include Heather, which is blooming right now and providing a bright spot in all the gray. This is the time of year where evergreens get a chance to stand in the spot light. 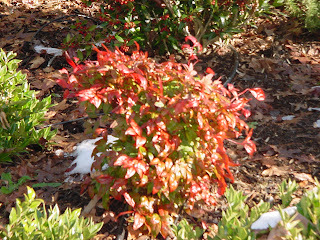 I have little munro pines and spectacular dwarf nandina firepower....with it's brite red hues in the fall and winter. This is one of my favorite year round shrubs. In the spring and summer it has lime green leaves and they turn a fire red in the fall and winter. 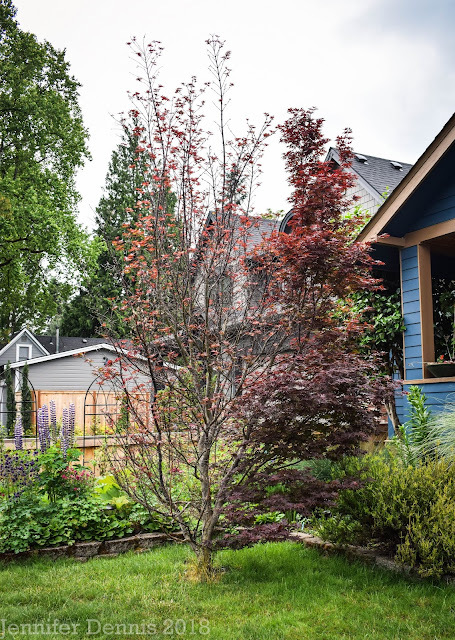 I enjoy using dwarf nandina in my flower beds because it is compact and slow growing, but it's also lacy and delicate, blending well into many garden styles and is very popular in Asian themed gardens. Needless to say, even in the soggy rain, I get a kick out of my lovely evergreen plants.